Made to order - please allow one week for your order to be ready. HOLLOW MILK CHOCOLATE RABBIT $10.00 This delicious rabbit is crafted in Woodinville of creamy, delicious milk chocolate. It stands about 8-1/2 inches tall and is colorfully packaged in cellophane and ribbon. Approx. 8 oz. 14" Rabbit - $30 Here he is, carrying his wicker basket and sporting a spotted scarf. Milk chocolate goodness, hand-decorated with white and dark chocolates, he will hop into your home wrapped in a cellophane bag tied with a brightly colored ribbon. (shown with 8-1/2" rabbits). TOFFEE BUNNY - $3.00 each Melt-in-your mouth toffee bits are combined with Belgian dark-milk chocolate to create this bunny, then it is finished off with a sprinkling of sea salt from the Washington coast. 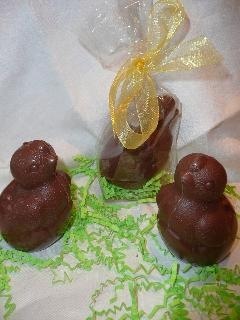 MILK CHOCOLATE CHICK - $5.50 Which came first, the chicken or the egg? You can enjoy both with this adorable milk chocolate chick, emerging from an egg. Wrapped in cellophane and tied with a yellow ribbon, this hollow confection stands about 4" tall. Approx 4 oz. SPOTTED EGG - $10.00 each Break open this 4-inch dark chocolate egg and out spills a toffee bunny, a popping egg (chocolate and pop rocks), and foil wrapped dark and milk chocolates. 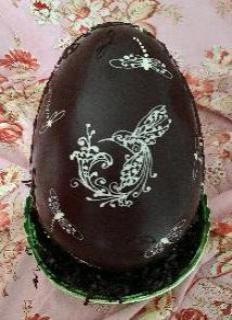 ITALIAN-STYLE EASTER EGG - $75.00 Made to order, every one of these 8x12 eggs are individually decorated with a unique design. Inside of each you will find an 8-1/2" milk chocolate rabbit, 4 toffee bunnies, small eggs filled with peanut butter, mint and coconut/almond along with milk and dark foil wrapped chocolates. If you would like to add your own special treat, just let me know when you are ordering, bring it by my kitchen and I will seal it in cellophane and include it with the rest of the chocolates (as long as it fits). Please allow one week for a large egg to be ready.